Cardiac anesthesiologists in the Department of Anesthesiology at Weill Cornell Medical College are physicians who are specialists in the care of the patient with cardiac disease undergoing cardiac surgery and other procedures on the heart. 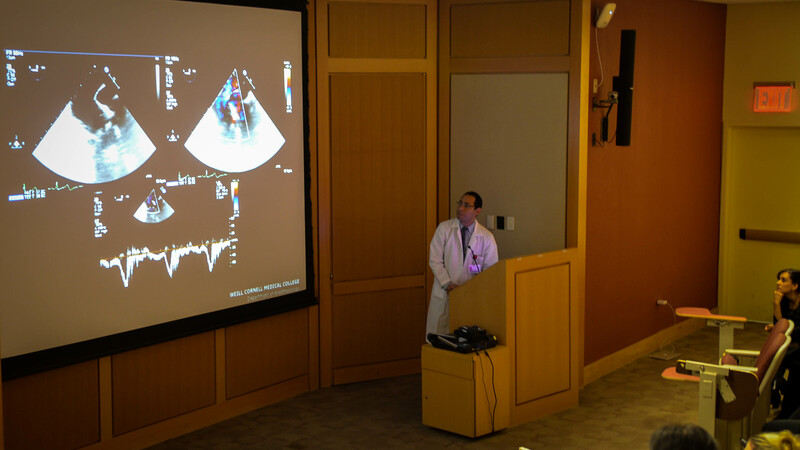 Cardiac anesthesiologists are fellowship-trained in Cardiothoracic Anesthesiology and have additional expertise and Board certification in heart ultrasound ("Perioperative Transesophageal Echocardiography", TEE). Our cardiac anesthesiologists have extensive experience in taking care of patients with cardiac disease for all types of cardiac surgical procedures, such as coronary bypass surgery, and valve repair and replacement with standard or non-invasive (percutaneous) techniques. Additionally, we provide anesthesia care for non-operating room interventions, such as percutaneous closure of congenital defects (atrial or ventricular septal defects) and electrophysiology (heart rhythm) procedures. The anesthesiologists are responsible for your pre-surgery "tune-up", so that you are best prepared for the surgical procedure and anesthesia, intraoperative care during the surgery, and immediate post-operative recovery, including care in the CT-ICU (4 West). At all times, the anesthesiologist is aiming at providing the best care under the safest conditions. To ensure the patient's maximum safety and best possible outcomes, a number of catheters and devices are inserted after the patient is asleep to facilitate monitoring. These include an arterial line (to monitor the blood pressure), a central venous catheter (to monitor the heart function and administer medications), and an ultrasound probe (TEE) inside the esophagus and stomach to image the anatomy and function of the heart chambers, valves and vessels before and after the surgical procedure. Some of these catheters will remain for a few days after surgery to help anesthesiologists and surgeons to monitor the patient closely during the initial recovery in the CT-ICU. Anesthesiologists who are also trained and board-certified in Critical Care Medicine manage the post-operative care of cardiac surgery patients in the CT-ICU. When you arrive to the ICU from the operating room, the CT-ICU team will take over your care and begin the process of recovery. You will have received a variety of anesthetic and pain medications in the operating room and will not be fully awake when you arrive to the ICU. During this time there will be a breathing tube in your mouth and that is connected to a ventilator. The tube goes in between the vocal cords so you won’t be able to speak, however, a dedicated nurse will look for any signs of discomfort and promptly administer pain medications if needed. If the tube needs to stay in place for a longer period of time, we will give you sedative mediations and constantly check in to make sure you are comfortable. As soon as you are awake, and breathing safely on your own, the breathing tube will be removed. It is our goal to separate you from the ventilator as soon as it is possible and safe! The ICU team continuously monitors your overall condition. This includes heart function, other organ functions, heart rhythms, blood sugar level, nutrition, physical therapy and much more. We correspond with the surgical team on a regular basis to insure that the best decisions are made regarding every aspect of your care. Finally, the ICU team will keep you and your family updated on your condition to make sure you know exactly where you are, on the road to recovery!